Champagne is synonymous with special occasions. Whether ringing in the new year, toasting a happy couple at a wedding, launching a ship or celebrating other events (such as getting “feet” on macarons after several failed baking attempts! ), champagne certainly adds a touch of class. 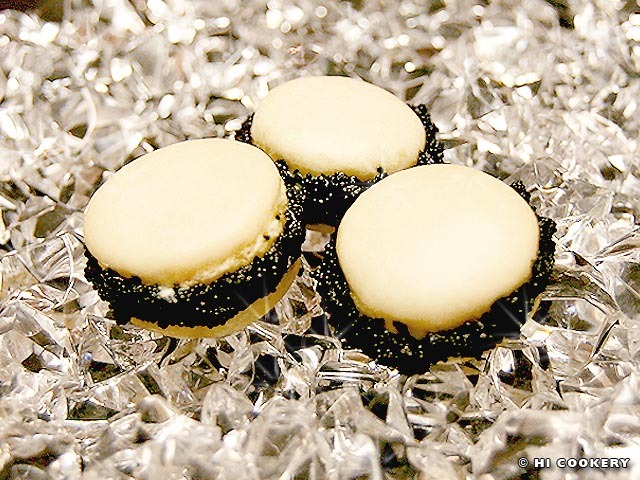 We gave our macarons a glamorous makeover by using the special sparkling wine as an ingredient. Both the shells and buttercream filling contain a bit of the bubbly. 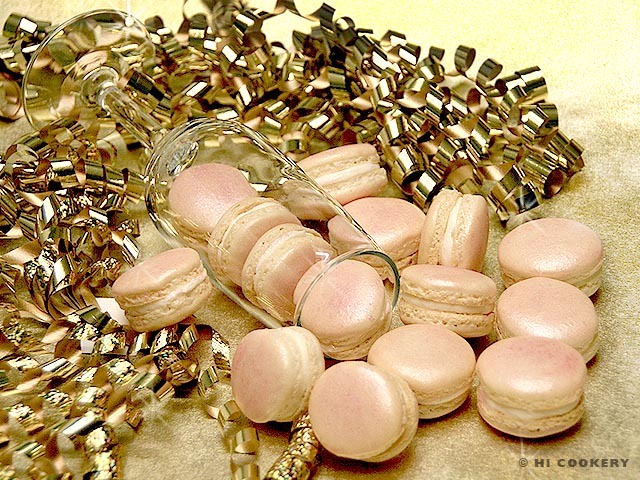 Serve champagne macarons on New Year’s Eve and National Champagne Day to add prestige to your party! 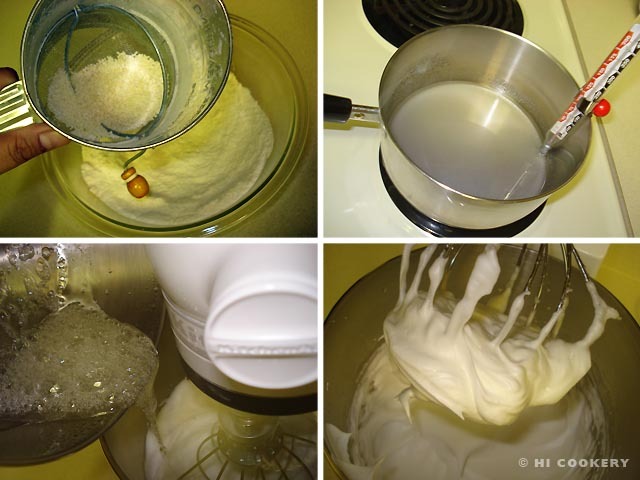 In a large mixing bowl, cream the butter with a pinch of salt until smooth. Stir in the vanilla. Gradually add the powdered sugar. Thin to a spreadable consistency with champagne. Fill a pastry bag with a large round tip. Pipe in the filling and sandwich the macarons together. Refrigerate for at least 30 minutes to let the filling set. 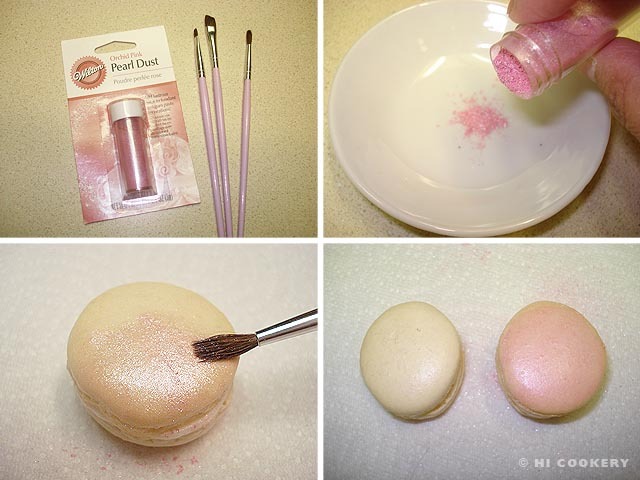 Using a dry, food-safe brush, paint both sides of the macaron shells with edible pearl dust to give them some sparkle. Mac Attack #14 challenged us to create a macaron with a sweet and savory flavor combination. 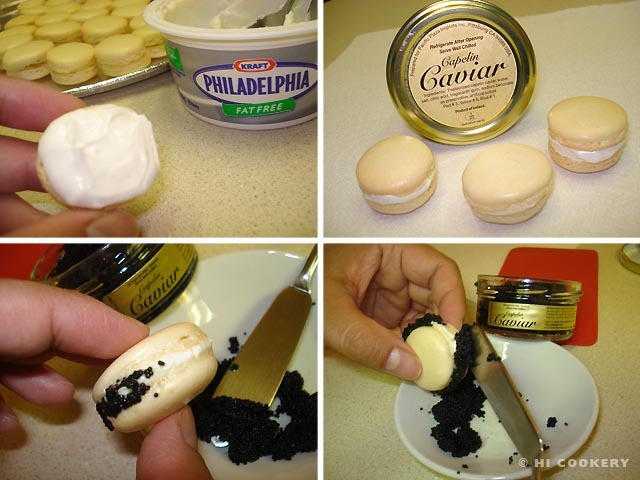 Our entry at MacTweets was a champagne macaron shell (recipe above) sandwiched with whipped cream cheese filling and rimmed with capelin caviar (directions below). YUCK! No offense to our friends who indulge in the overpriced and overrated fish eggs, but we probably just have beer tastes over a champagne budget! 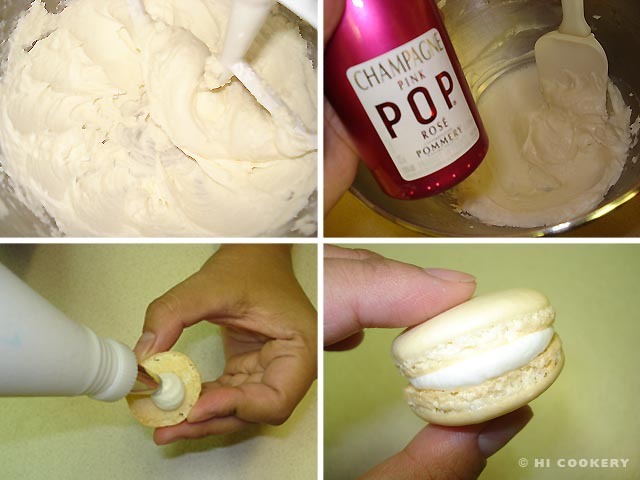 Make the sweet champagne macarons. Prepare the savory filling. 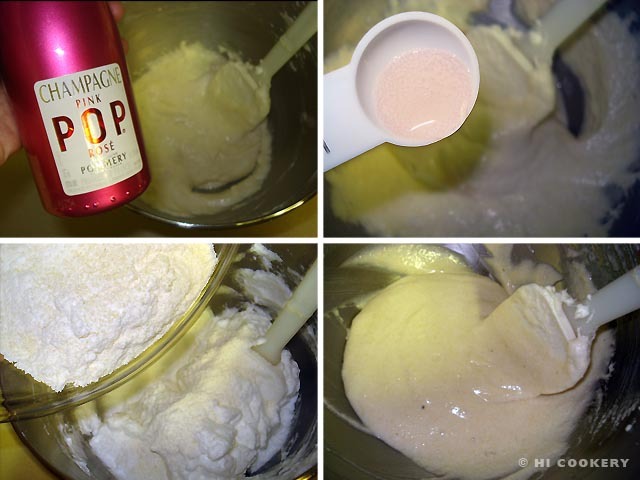 Whip the cream cheese to a spreadable consistency. Generously coat one half of the macaron shell with the cream cheese. Place another shell on top of it as a sandwich. Press the caviar on the sides of the cream cheese filling with a spreader. Serve immediately as caviar is perishable. Caviar is considered to be a rich, upscale and luxurious delicacy. It pairs well with champagne or vodka. Highlander first sampled the salty spread in his college Russian class. Islander’s Ukrainian friend, Olga, introduced her to the reeky roe. Caviar is typically served straight from its container on crushed ice, inspiring our final photo food photo above. It is usually spread with crème fraiche on lightly buttered toast as canapés (appetizers) at fancy functions. We substituted the crème fraiche for cream cheese just for the photo because it was a solid spread that did not make the macaron shells soggy. Our pink champagne macarons baked into a bare blush hue. We recommend painting the shells with edible pearl dust (gold, white or orchid pink) to correspond to the type of champagne used in the macaron ingredients (sparkling wine, blanc or rosé). 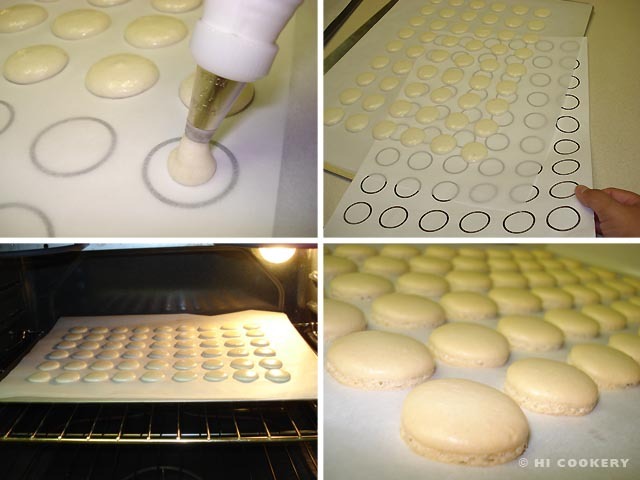 See our Mac Attack page for more macaron recipes.